This offer is valid on all our store items, available to you at checkout. Matt or glossy won’t even begin to describe the natural stone tiles that will recreate this great beautiful artwork Martini Dance by Megan Duncanson. Soon, you’ll have a unique mosaic that will make your space spectacular. This stunning mosaic art is perfect as a mural for any office, bedroom or living room. Our mosaics are made from natural marble and stones, naturally resistant to different environments (dry, moist or wet) and weather conditions (frost, sunlight or extreme heat). 100% Happiness Guarantee: 30 days full refund if for any reason you are not happy with your purchase. Step 1. Gently open your package and unravel your mosaic. The mosaic is mounted on a fiber mesh backing and wrapped with a protective film from the reverse. Gently remove the protective film without damaging the mesh and remove any excess glue. Should individual stones have become loose during shipment, glue them back using a solvent-based adhesive. Step 2. Using your trowel, spread a thin layer of adhesive or white thin-set mortar across the surface you wish to tile. If you’re placing your mosaic on a vertical wall or ceiling, you can always glue it to a wooden board and secure the board to the wall. In the case of large wall installations, nailing little nails into the gaps between the stones for a stronger seal is recommended. If the mosaic is to be laid in a humid or wet room, the laying area must be made waterproof. A special sealing adhesive should be used. Step 3. Gently place the mosaic and use the flat end of the grout float to ensure the mosaic is perfectly flat and well adhered to the surface. Remove any excess of mortar with a damp cloth. Step 5. Once dry (will take approximately 24hrs), apply a marble and stone sealer. Step 6. Take a step back and admire the space you’ve just transformed. If you have any questions, we’re happy to help. Just email us at [email protected] or chat us up. Disclaimer: No warranty is implied by these instructions. Use at your own risk. Please wear goggles when cutting mosaic materials or mixing grout. Mosaic materials are often sharp. Keep out of reach of children. 1. Nothing’s set in stone. Yet. Before you buy, you can customize: For any surface: Turn it into a floor inlay or rug, wall decoration, backsplash, countertop or tabletop. For any space: Make it sparkle indoors or outlast sun, snow and cannonball splashes outdoors. For any style: Change the size, natural stone type and color. 2. All mosaics are not created equal. Each one is made of natural stones, hand-cut by our artists. This means that while your art will look like the image above, we can’t guarantee an exact replica. Your masterpiece will have slight variations in color and cut of the tiles that will make it truly one of a kind. If you have any questions, we’re happy to help. Just email us at [email protected] or chat us up on live chat. 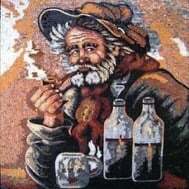 We found other mosaics you might like! At Mosaics Lab, we make art for you to walk all over, splash all over, lean all over and look all over. We invest in high-quality, handcrafted tiles, offer infinite designs through customization, deliver to your doorstep and offer great customer service, so you can be sure to love your mosaic. Copyright © 2019 Interiors Lab. All rights reserved.